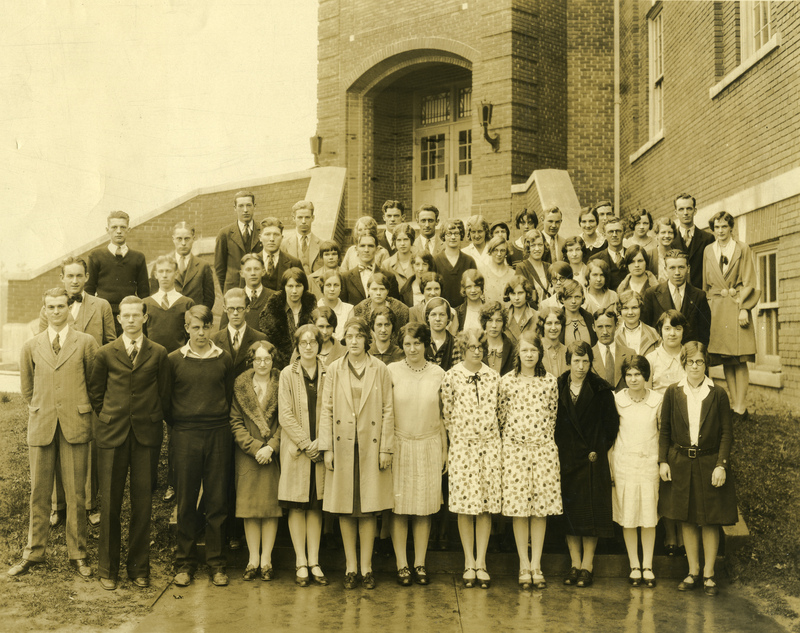 Standing in the front row of the photo of 1930 graduates of Buncombe County Junior College is a young man named Gordon Greenwood. He is the rightmost of the three boys, and at the time would have been almost twenty-one years old, having been born in Black Mountain, NC, on July 3, 1909. After junior college, Gordon would continue his education at the University of Illinois (where he got a degree in journalism), and the University of London. He would serve as a psychologist in the US Army during WWII, marry his wife Garnet after the war, and they would then own and operate the Black Mountain News for over twenty years. He would be director of admissions and assistant to the president at Montreat College, an assistant professor of journalism at Boston University, and serve on the board of both Asheville-Buncombe County Technical College and UNC Asheville, as well as giving service to numerous civic, business and veterans organizations. If all that wasn’t enough, he served as a member of the NC House of Representatives from 1959 to 1966, and from 1972 to 1992, introducing the bill that created the State’s community college system. After his death on February 16, 1997, the NC Senate passed a joint resolution honoring the life and memory of Gordon Hicks Greenwood, and in doing so, provided the basis for this brief biography. But what about the junior college student that would go on to do all these things? What do we know about him? The answer is quite a bit, thanks to materials in the university archives. By their very nature, the university archives are more institutional than personal, but among the few personal items that we have are two small scrapbooks created by Gordon Greenwood when he was a student, that give not only an insight into Gordon’s time at Buncombe County Junior College, but also background on the college itself. 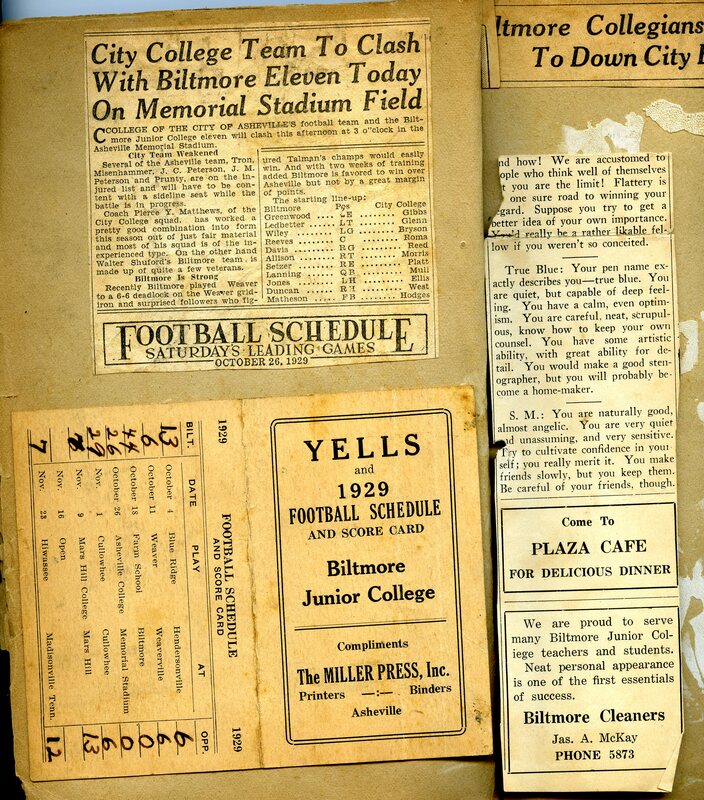 Many of the clippings in the scrapbook cover athletics games, for both Buncombe County Junior, and Barnardsville High School, which Greenwood attended prior to college. From these clippings we learn that Gordon excelled at football but also played basketball and baseball for the college. Given the size of the student body, the 1930 class had only around 70 graduates, one can image that anyone with a semblance of skills would be drafted to play, but Gordon does seem to have genuine skills, especially at football. He was also a young man who clearly loved to see his name in the paper, to the extent that he underlined the passages that mentioned him, even if they were slightly derogatory, such as the one shown above where he was described as “the rolly-poly guard”. Presumably by the time he became a Representative he had stopped underlining items about himself, but you never know. The clippings also tell us that the college, only in the third year or so of its life, held its own in the sporting arenas, and that local rivalries had already been established. But the clippings also reveal some things about the name of the college. 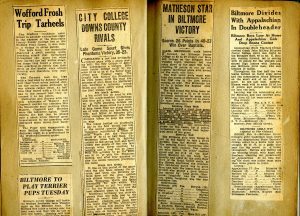 In The University of North Carolina at Asheville: the First Sixty Years, William Highsmith wrote that the name change from Buncombe County Junior College to Biltmore Junior College occurred in 1930, a statement seemingly borne out by the invitation to the 1930 commencement exercises being issued under the Buncombe County Junior College nomenclature. 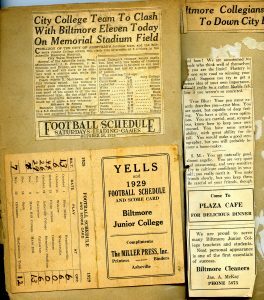 However, many of the clippings and documents in Gordon Greenwood’s scrapbooks refer to Biltmore Junior College prior to 1930, and as shown below, the 1929 football schedule is for Biltmore Junior College, and not Buncombe County Junior College. Why is something of a mystery. In August 1984, Bill Highsmith interviewed Gordon Greenwood as part of a series of recordings forming an oral history of the university. They talked about Gordon’s time at the college, including how he traveled from Grace, where he lived, on the streetcar, before walking to final mile and a half to the college. (The special school fare was a nickel a day, substantially more than college fees, which at the time were free.) 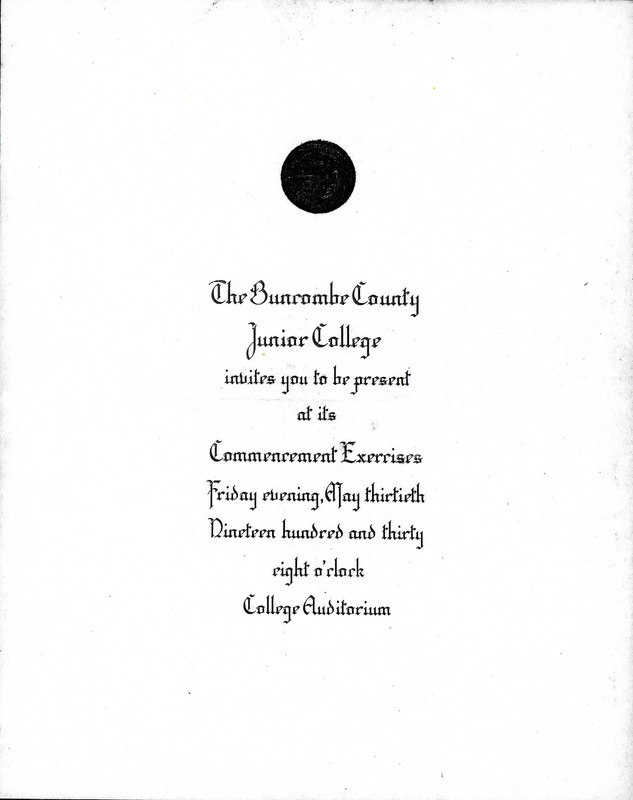 Highsmith also asked about the college name, and Greenwood thought that the name changed after he graduated (as the invitation shown above would suggest) but that his class ring, which he got at graduation, was from Biltmore Junior College. 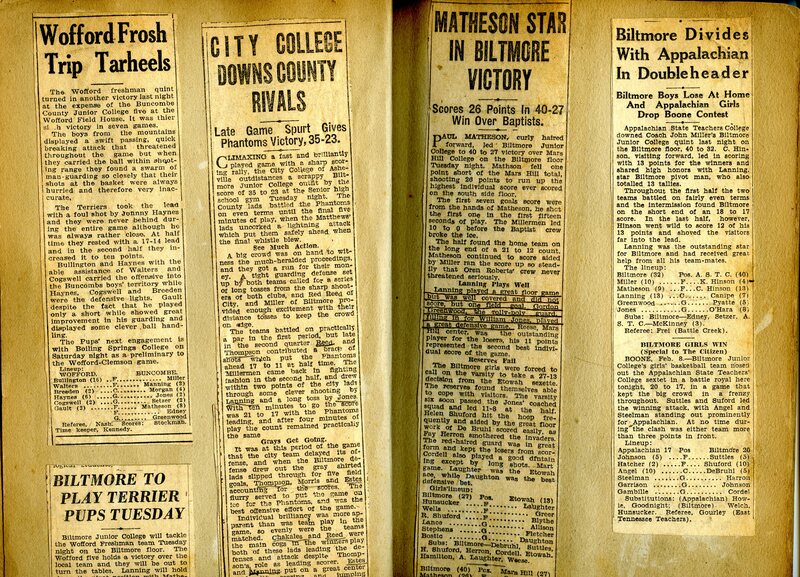 He also noted that sports stories, as his scrapbooks confirm, used Biltmore Junior College. All very mysterious. 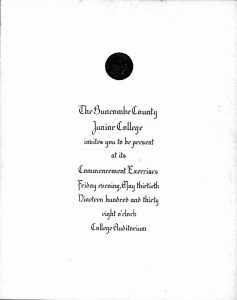 One item that might clarify things, or not, would be a 1930 diploma, but unfortunately we do not have one of those, or even a commencement program from 1930, in the archives so the mystery of the name change continues. In 1985, Chancellor David Brown established the Chancellor’s Medallion with a replica of the Medallion being given each year to an individual whose life and service have “demonstrated the deepest commitment to the enhancement of UNC Asheville”. Gordon Greenwood received the Chancellor’s Medallion in May 1986, and in November 1986, the new university playing field complex was dedicated as the Gordon H. Greenwood Recreational Fields. Why that was should not be a mystery.